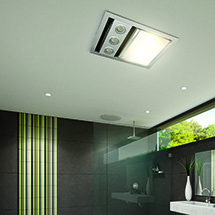 Many Australian homes today have an IXL ‘Tastic’ in their bathroom whether it be a ‘Neo’, ‘Classic’, ’Eco’ or ‘Easy Duct’ – it’s a product that has arguably become an iconic element in modern bathroom design. The Classic range of ‘Tastics’ are suitable for retrofitting into your updated bathroom, while the Eco and Easy Duct models are designed to fit into new homes with a 5-star energy rating, or will appeal to energy-conscious home owners. Since 1858, the proudly Australian-owned IXL, has been designing and manufacturing premium products. Along with the ‘Tastic’, IXL is renowned for developing market-leading space heaters and ventilation products, including the Easy Duct Thermal Transfer System – a savvy innovation that allows you to get more bang for buck out of your investment in an existing primary heating or cooling appliance.